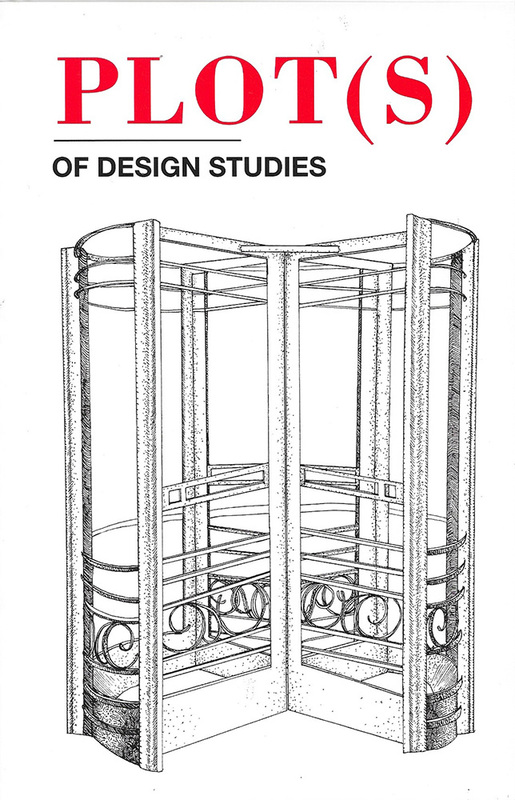 Plot(s) Journal of Design Studies is an annual peer-reviewed publication produced and edited by the MA Design Studies program at Parsons School of Design in New York. As a multidisciplinary journal, Plot(s) attempts to articulate the ways in which design can shape and transform the human experience. This year we will produce a double printed issue featuring Volume V and VI, which will be released in Spring 2019. Accepted submissions will appear in print and online as part of our multimedia online journal that explores the realm of design research. Submissions are open to graduate students, recent graduates, design practitioners, and academics from all fields. We are seeking submissions in the following suggested areas of exploration. Submissions venturing outside and beyond these themes will also be considered. We ask that submissions are guided by a process that involves design thinking/reasoning, and strongly encourage the use of supporting visuals. and well-documented design/architectural projects that reflect upon or challenge current design discourse and fit within our theme. Digitally-native content will be posted exclusively on Plot(s) Multimedia. Papers should be submitted as Microsoft Word documents. Papers between 1,500 and 3,000 words will be peer reviewed. The Plot(s) editorial board will edit shorter texts falling between 500 and 1,000 words. Submissions must be properly cited as endnotes and formatted in the Chicago style upon submission. Images must be at least 300 dpi, captioned, and copyright permissions must be attained. Please submit images in a separate zip folder attached to the email. Submissions which do not fit these criteria cannot be accepted. Please send submissions by November 30, 2018 (Friday) via email to plots@newschool.edu. The School of Art and Design History and Theory is pleased to announce its inaugural colloquium, scheduled to take place Friday and Saturday, March 2 and 3, 2018 at Parsons School of Design in New York City. 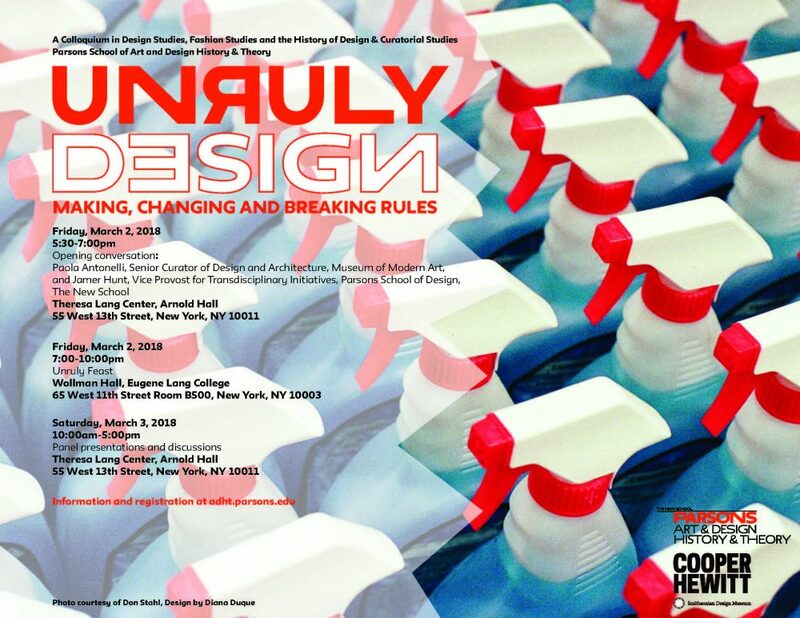 “Unruly Design” explores the rules that govern design concepts, acts of making and fashion practices both historically and in today’s context. Who sets the rules within a design field, designers, clients, consumers or end-users? How should designers engage the legal structures that bind production and consumption and/or respond to market forces? How might consumers and end-users rewrite explicit or implicit codes of use through practice? How are the rules of design made, changed or broken? Discussions will move across several fields of design— from design history to fashion studies; design studies to intersections of design with artistic practices—taking into account current historical and contemporary perspectives including policy making and service design. This two-day colloquium responds to current discussions on the inherent political and ethical implication of design practices, as well as an expanded cultural terrain where the idea of design has become mainstream. This series of interventions and conversations navigates the complex relationship of design with a certain sense of order—with ways of doing and modes of saying that frame design processes and their outcomes within more or less strict, often conflicting sets of rules. Is today’s design unruly or can it be? Speakers: Paola Antonelli, Museum of Modern Art; Otto von Busch, Parsons School of Design, School of Design Strategies; Lily Chumley, New York University; Tracy L. Ehrlich, Parsons School of Design, History of Design and Curatorial Studies; Carma Gorman, University of Texas at Austin; Denise Green, Cornell University; Elizabeth Guffey, State University of New York at Purchase; Victoria Hattam, New School for Social Research; Jamer Hunt, Parsons School of Design, Transdisciplinary Studies; Charlene K. Lau, Parsons School of Design, Fashion Studies; Ulrich Leben, Parsons School of Design, History of Design and Curatorial Studies; Andrea Lipps, Cooper Hewitt, Smithsonian Design Museum; Lauren Downing Peters, Centre for Fashion Studies, Stockholm University; Nicole C. Rudolph, Adelphi University; Georgia Traganou, Parsons School of Design, Design Studies; McKenzie Wark, New School for Social Research. The world of plenty or a headless chicken? Rule-makers and Their Discontents: Who Changed French Postwar Housing?